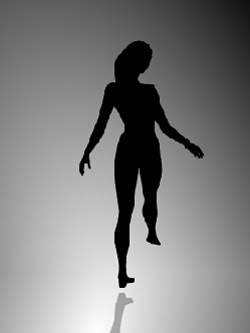 Spinning Girl Silhouette was an animated illusion that practically propelled our site to success few years ago. It was back in the old days when Digg was still a major player. Anyway, the article still receives certain amount of attention and comments, but I noticed how many still struggle seeing the lady spinning in both directions. As you can recall it is possible to see the silhouette of this young dancer spin in both directions. Heck, some observers can even change the spinning-direction whenever they want. I still struggle, but on few occasions I was able to do just that! Recently one of our fans shared his solution for this problem. Check the explanation below, where two additional representations of the same animation were synchronised and positioned next to the original. The only difference being the coloured contours, which should help you understand this famous illusion better. When you’re done, there’s still something I’d like to show you – did you know our dancer had a Spinning Husband, and both of them have a Spinning Pet?! Bizarre, right? Check both of them, and try to repeat what you’ve just learned! i can see both ways! The version with the red and blue lines is several years old as well. This is one classic illusion and I love it! But there is a problem. Everytime I look at it, it changes directions before I see the girl turn completely! Also, who added breasts to her? Wow, it’s a good thing that you had the solution posted. After watching the clockwise solution I see clockwise rotation, and vice versa. I can make her change directions…. really cool… thanks for sharing! lodovicus–where the shadow would fall depends on which side the girl’s being lit from, and the direction of the lighting is as ambiguous as the direction of spin. In fact, concentrating on changing the lighting rather than the spin might help some people reverse her direction at will! Ahh thank you for this. I saw the post with the original spinning girl awhile back and for the life of me couldn’t get her to switch. But thanks to this I can see it perfectly now! He nailed it. I can actually see her spinning in both directions at the same time thanks to the very simple colorations. Go figure. This is the coolest one I have seen on here. Very strange indeed, at first i was REALLY looking hard at the spinning picture trying to make it turn the other way, but had no success in changing its direction, but then i saw the other variations and after that i could easily switch her directions whenever i wanted, its so weird to think that they are the same animation. very clever. I had trouble at first, but I found by concentrating on the tip of her foot at the right time, I was able to see the spin direction instantly reverse. Didn’t even notice, thought you were pedaling some sort of BS.. But being with your desktop ap for a year or two, maybe three, I figured I’d read on a little; and sure enough deliver is your specialty. This is a very good explanation. I think it would be stronger if it didn’t have the shadow……. if you cover the top of her body and just look at her feet, it is easier to see both directions without looking at the other diagrams!! initially i saw her spinning in a single direction, then she starting doing half turns from the back to the front in alternating directions. Now it’s very easy to change spinning direction. If you only look at the reflection of her ”spinning leg” the she will be moving only from left to right and vice versa ,so then she would not be spinning at all!!! You have been royally fooled. She is not spinning around at all. Not clockwise. Not counterclockwise. Cover up all but the shadow of her feet. You will see that she actually is oscillating back and forth in a 90 degree arc while bouncing up and down. Still, it produces a nice optical illusion. I can see it spinning both ways my problem is with all three of those images, I am seeing two spin in opposite ways. That is interesting, because when I see one start to spin in the opposite direction. I look at all three and they are all going in the same direction. Maybe, subconsciously, my concept of the group is more powerful than my concept of the individual. Food for thought. Actually it’s the hips. The rotation can be reduced to a quater turn simply by looking at the hip moving up and down. I’ve never seen this before. But, I’m a consummate puzzler since I could walk. I’m old now and my father always bought me spacial puzzles. Love thos though. Sharing on FB. I can see her turning right, left and also going back and forth without doing a full turn. This is fake. The figure changes her direction every few seconds. That’s why you think you are seeing her spin in both directions. Look at her arms. One time her right arm is raised, the next thing you know, her left arm is raised. NIce try but very fake. Not fake at all. I can stare at the center silhouette for several seconds (I counted 15 just now) without it changing. But the moment I glance to the one to her side that is spinning in a different direction, then glance back, the silhouette has changed direction. Then if I glance at the other one to her side and back again, her direction has changed again. Yet then if I just keep staring at the silhouette, she doesn’t change direction for a while. In other words, I can look back and forth to the ones at her side, and change her direction over and over in less than a second each time. The reason why I think you’re seeing it change every few seconds is that your peripheral vision is attaching itself to the ones on each side. Once your peripheral attaches itself to the one on the side that is spinning in the opposite direction, the silhouette changes to that direction. That’s why if I stare intently at the center one, it doesn’t change, but if I allow my vision to also see the ones on the side, the direction of the center one changes. It’s very strange, but not fake. She has a point though tbh. If you just stare at the top image long enough without looking at the guides below, it changes, even when you’re strictly just concentrating on the way its moving. I stared at her head and just use my peripheral vision to notice the direction it was moving. Not trying to change the direction, just keep staring and then all of a sudden, it switched. I know this comment is 3 years old, but are you stupid? Stare at the bottom gif only on one side and tell me if it is switching every few seconds. This illusion is actually supposed to show how brain-washed we are. Only few people can immediately see it rotating in both directions. The majority of people can’t, and see it mostly rotating clock-wise, which means that are quite brain-washed by modern media. I think it has more to do with how our brains inherently work than with any sort of brainwashing tbh. According to the reflection of her feet she is rotating anticlockwise, not oscillating, nor rotating clockwise. No other possibility there is. this is cool- i can see her moving both ways! I just think that it is a matter of perception as to which direction you see her spinning, just like everything in life and that involves the universal gift of free will. All of us possess it, but many of us resent that everyone else also possess it.